The murder of a beloved priest sends shock waves through Cork. Easy as it is to blame atrocities in 1925 Ireland on the Republicans still fighting for a united nation, the Reverend Mother Aquinas is quite sure they had nothing to do with the murder of Father Dominic. Reverend Mother grew up in a wealthy family and had many acquaintances among the protestant Anglo-Irish, including Dominic and his brother, Lawrence, who both converted to Catholicism and became priests. When Dominic’s found dead in the confessional, stabbed through the ear, a former pupil of hers, Inspector Patrick Cashman, is assigned the case. Dr. Scher, the police surgeon who also treats the nuns, had seen Father Dominic in an antiques shop, where the priest seemed disturbed by a rare Japanese statue of a hawk. A talk with her cousin leads the Reverend Mother to identify the hawk as one of a pair they’d seen in a house they’d often visited as young women, a house the Republicans supposedly burned to the ground. One of the people spotted in the church before Dominic’s murder was Peter Doyle, the antiques shop’s Protestant owner. The Reverend Mother suspects Doyle and his friends are stealing valuable antiques and covering their tracks by burning down the houses where they were displayed. But why would they murder the priest, who had no way of proving the hawk was stolen? Loyal Republican Eileen MacSweeney, another former pupil who sings in a theater group Doyle and his friends founded, is more than willing to snoop on behalf of the clever nun. The Reverend Mother feeds information to Cashman, whose superiors are eager to blame the Republicans. Her broad acquaintance within every social class in Ireland gives her insights denied the police. 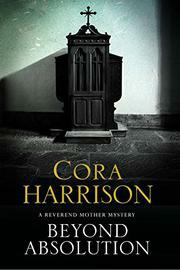 After Doyle’s found murdered in the same manner, the Reverend Mother faces some dauntingly difficult decisions. Beneath the entertaining historical tidbits, Harrison (A Shocking Assassination, 2016, etc.) provides a puzzle that will challenge the most dedicated mystery reader.